Safety Tech can be Simple But Smart. AMEC AIS SART PLOMO-500 complies with IEC 61097-14 specification. It is designed to be an alternative of Radar SART. AMEC PLOMO-500 can transmit GPS positions, Unique ID, COG and SOG in every minute once activated. It allows the rescue team to locate the survivors rapidly through the broadcasted AIS information and, ultimately, gives the lives a better chance to survive. 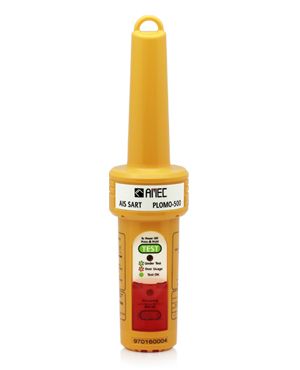 AMEC PLOMO-500 is not just only the AIS SART itself but also a complete survival/distress solution of all other essential accessories of AIS SART. The solution comes in a survival bag and during emergency times, it is all what user needs to carry on his/her back. The setting operation is easy; it only requires 4 simple steps. AMEC PLOMO-500 has a backlit operational panel which allows users to see the buttons in dusky environment. Moreover, main unit has an over usage design to indicate if the battery life has been compromised due to excessive testing or it had been activated previously. Also, to increase the chance of survival, unit’s LED indicator signals “SOS” distress message during activation for the survivors to be easily spotted by the rescue team.